I’ve finally made my first bit of money blogging! I’m so proud to be writing this. Although my blog is in the early stages (it’s around 3 months old), I’ve actually been blogging for just under a year. I started a beauty blog but was learning as I went along. And as a result, my blog was a bit messy. However I think this is partly why I’ve made money on this blog early on. I already had experience (and had made a lot of mistakes). So starting this blog, I was prepared and focused. 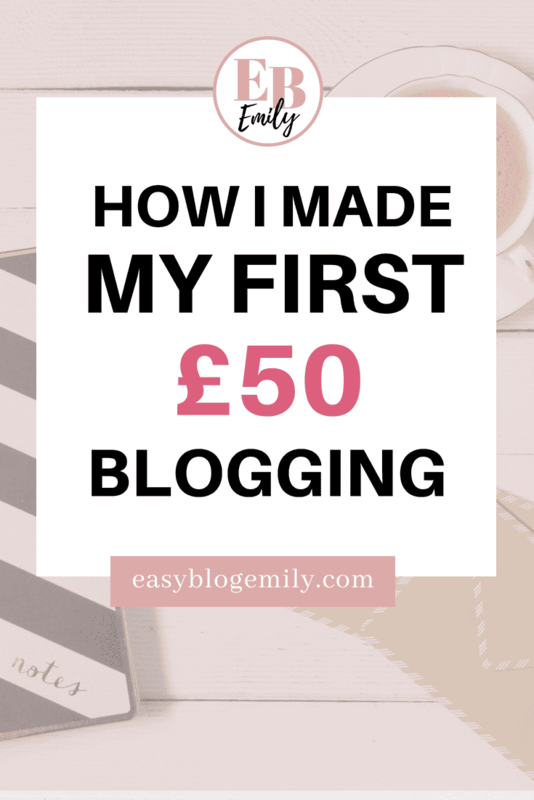 I’ve written this post to explain how I’ve made my first £50 blogging. With a small audience and less than 20 blog posts published. First you’ve got to understand is that I’ve put a lot of effort into my blog. As will have every aspiring/ successful blogger. Before earning any money. I’m talking hours and hours of planning, writing, promoting. Setting stuff up, having melt downs when things go wrong. There have been numerous times when I’ve made changes to my website then had a hissy fit when it’s all gone wrong. And all this without even knowing that I would make any money. So please get it into your head that it isn’t a case of “Oh! I just put this here and then BAM! I made some money! Easy Peesy!”. Because people who say that are lying. Making blogging a business takes hard work and determination. HAVING SAID THAT. The opportunity to make the £50 that I did just sort of fell into my lap. Despite spending months trying to make money and not seeing a single penny, this just sort of appeared out of nowhere. I was actually shocked. I hadn’t planned to make money this way as I had just started working on affiliate marketing (more on this to come). Then, I had a message on Pinterest saying that this person wanted help with some branding for pins for their blog. And that they hadn’t been able to contact me through my blog because I didn’t have a page to do so. That my blog is good enough that someone wants me to help them with theirs. I hadn’t provided a contact page so people could get in touch… (I wonder how many other clients I had missed out on because of that one stupid mistake). Needless to say I added a contact page straight away. I had already written a lot of posts on creating images such as what makes an image stand out on Pinterest, so I was thrilled that someone was interested in what I had written and wanted more help. But this was my first time offering a service through my blog, so I was a little nervous incase they weren’t happy. I’m pleased to say the person was thrilled, and said they’d love to get in touch in the future for more help. This has been such a confidence boost for me. It hadn’t even crossed my mind that I could offer services. I am a new blogger after all! Months of hard work but staying motivated without promise of making money. Being willing to go out of my comfort zone and try something new. Connecting with other bloggers- this was probably my first real conversation with another blogger. You forget sometimes reading blog posts and looking at profiles that there are actual real people behind these screens putting in the effort. Going above and beyond to make sure my first client was happy. I was thrilled they wanted to work with me. I wanted to be certain they were pleased with what I gave them! So, why have I shared this blog post? Mainly to prove to you (and myself) that IT CAN BE DONE! You CAN make money blogging! (Up until this point I was beginning to doubt all the income reports I had seen). 1. Add easy ways for people to get in touch with you. Whether it’s to offer services or for another reason, the easier you make it for your audience to get in touch the easier you are making it for clients to get in touch. Meaning you’re more likely to make money. 2. Offer services. You’d be surprised- that thing which you’re sort of good at but not the best? You’re probably better than someone at it. And that someone might want to pay you to help them be better at it. This can be anything. Even if you just put a page saying “I offer services, please get in touch if you’re interested”, at least then your audience knows that you do actually offer services. They’re not mind readers! 3. Have confidence! The main reason I hadn’t put up that I offered services, was that I hadn’t had the confidence to. What could I offer as a blogger who hadn’t made any money and who’s blog was only a few months old? I don’t know why I had this mindset. It seems almost silly writing it, but the person who messaged me wanted help with design work. And I’m 2 years into a design degree…. …Learn from my mistakes. Please. Have confidence in yourself. Fake it till you make it. All that stuff. And if you’re looking to make money online, please check out this post on how to make money using Pinterest. Yes that’s right- you don’t even need to have a blog! Make money whilst you sleep: what is affiliate marketing? Wonderful post Emily! This is definitely a confidence booster, although I haven’t started my blog yet, I am working on it. Right now I still don’t have a clear vision on what I want to blog about, but I am determined. I have wanted to start something of my own for so long, and your posts are inspiring. Also, I would love some tips on what to blog about, I already had a blog before, so I do know the basics. Blogging about blogging is actually my goal, but since I haven’t made money online before, I was recommended not to blog about blogging until I get an income from another niche. And now I’m lost.. I started as a beauty blogger and it was a bit of a disaster, and whilst I’m glad to be where I’m at now I wish I had gotten there sooner. I’m glad my posts are helping you 🙂 I’d love to help, I’ll get in touch with you ASAP!